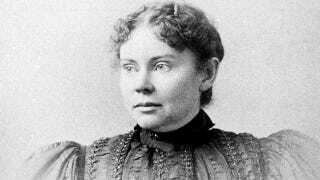 Lizzie Borden took an axe, gave her mother fourty whacks, when she saw what she had done, she gave her father fourty-one. Many people don't know the real story of what happened and her trial. It seems like a good time to look at her and her history, especially with Maplecroft by Cherie Priest being released just two days ago. The first book is named after the mansion that Lizzie and her sister bought after the trial. In 2010, Stuff you Missed in History Class did a podcast on Lizzie Borden. Then, as more historical knowledge has emerged, they did an update podcast about two years ago. It's a great listen and it gives you details of the case and evidence around her. Then, once you listen to the old podcast they talk a bit about the newer things that have been found. I hope you give it a listen! But, if you're not inclined to podcasts or maybe already know most of the story, you can read about the found notes on The Mary Sue.